If you subscribe to Profantasy’s monthly annual you can this month pick up the latest style I’ve made for them (June 2014). The style is a black and white battle map style that mainly is made for online play on sites like roll20.net. The idea for the style comes from a commission I got last year when a client contacted me for some maps that he could use for his online games with his friends. The maps were all in the same square sized format and followed some specific rules, which made them rather quick to do. After having done a couple of maps I really started to like doing them, it was a lot of fun. I made eleven maps before the client’s campaign came to an end, and no more maps were needed. But I couldn’t really drop the idea of the maps, and started to think that there probably are a lot more people out there that would like to have a quick way of making maps like this. So I contacted Ralf and Simon at Profantasy and asked them if they would be interested in releasing a style based on the maps I made for the client. They thought it was a great idea, and the result you can see in this months (June 2014) annual. The goal with the style is that you as a GM should be able to make a map in about ten minutes (or more if you really want to fiddle around) that you can use for your game. 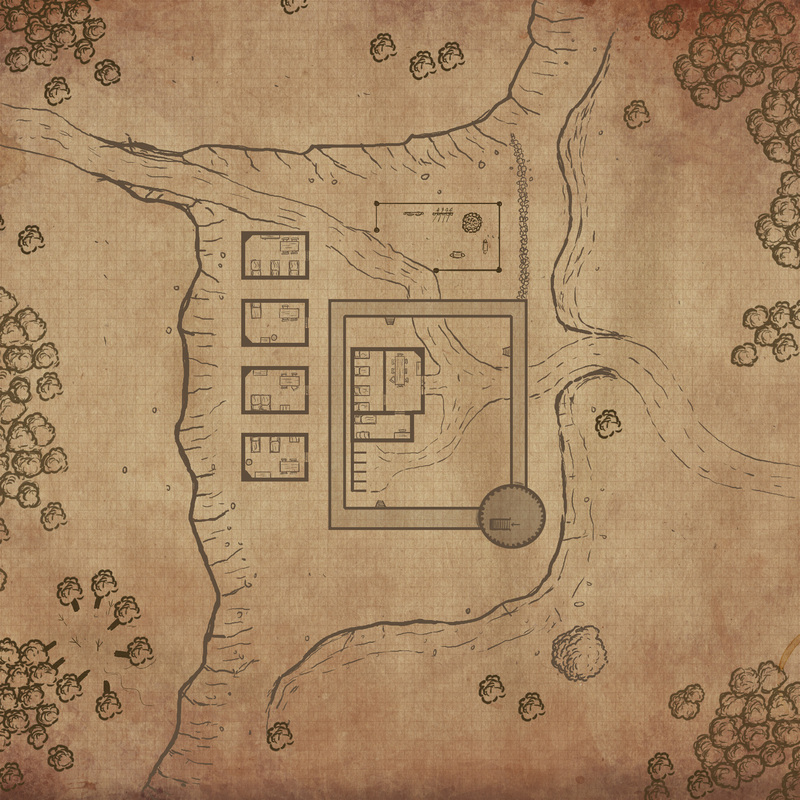 In the end when you get used with the style you probably can have a short break while gaming, quickly create a map of a small town, mine, forested area or something else you need, and then add it to your gaming night. I started to play RPG’s some years too late to really experience the old hex crawling games. But for some reason I’ve always liked the simplicity in the world and area maps used by then. So when I was asked to make a map for a Swedish old school adventure called “The valley of the Snake god” (Ormgudens dal) I gladly accepted. The adventure is a tribute to the old hex crawling ones and I was asked to make the full colour hex map in the middle of the book, yes the one you can see at the top of this blog post as well. The map was really fun to make and to help me out I used the 2010, July annual from Profantasy. As always when you use a style as your base for a commissioned map there will be symbols that are missing. So to solve this I had to make the symbols myself. That maybe doesn’t sound that hard but the problem you get is that even though I easily can make some hex symbols, the one I made had to fit in with the already existing ones. If you don’t succeed the new symbols will be in the way for the overall harmony of the map, and I know I at least would get very annoyed by that. Lucky for me I’m quite good at copying a style while drawing and I’m very pleased with the new symbols I made for the style, can you spot them? What makes up a great map? That is a question I often ponder on. When I make my maps I always try to make more than just a map, I try to make a story. One of the first fantasy maps I came in contact with while growing up was the map in lord of the rings. And just by looking at that map you could see stories unfold. You could follow the rivers, the forests, mountain ranges, everywhere strange names. It took some time between me finding the map and me reading the book. But before starting on the book I already knew a lot about the world, just by looking at the map. That is how I want my maps when I make them, I want them to tell stories. The more you look at the map the more things should start to unfold in front of your eyes, make you follow the rivers, finding the kingdoms, the wastelands. I want my maps to be like a library of imagination. Another challenge is when someone else want you to make a map for them. I’m always flattered when people contact me and they want me to do that. They are actually trusting me that I shall make a map of something from their imagination, and of course I want that to be as good as possible. It is always hard to create something that someone already might have a clear view of what it should look like. Usually you have to meet somewhere in between, and it is always easier to make a map if you know a bit of the story. And if you know a bit of the story you can put that into the map. 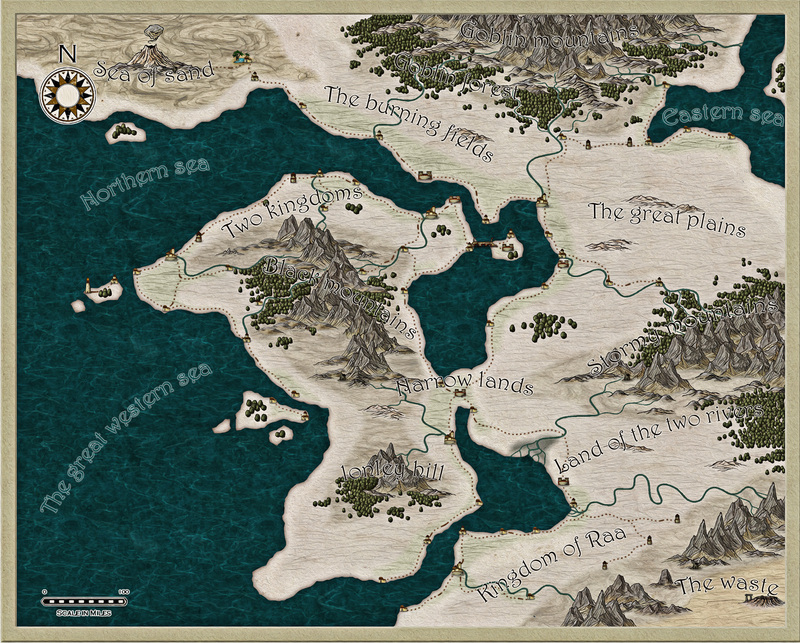 The map at the top of this post is a commission I made for the Chronicles of Lo-Hin, you can read more about that by visiting their homepage. The client had a clear view on what he wanted and after a while we agreed on using Jon Roberts Overland style from Profantasy’s March annual in 2011. 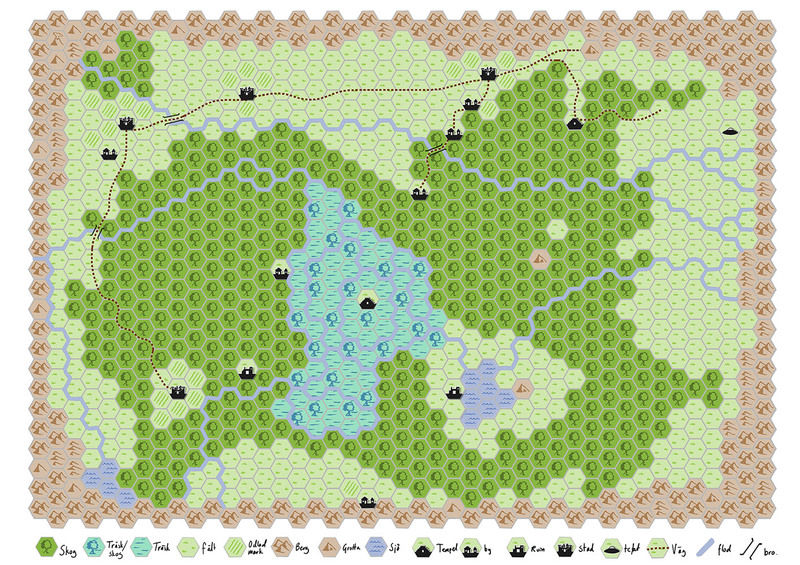 Personally that style is my favorite overland style that has been released for Campaign cartographer 3 (CC3). All symbols in the style are absolutely gorgeous, so when my client asked me to do some custom symbols that would fit into the style I nearly freaked out and thought, that wont be possible. But I gave it a try and I must say that I’m quite pleased with the result. Can you spot them? I worked quite a lot on getting the style the way I and my client wanted, I’ve tweaked the style a bit in Photohop by applying some filters and textures to give it the feeling we were after. 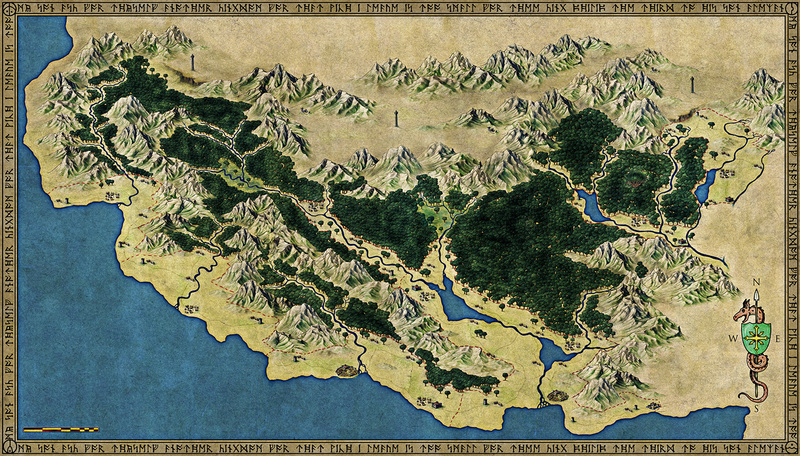 This is also the first map where I decided to make the rivers in Photoshop instead of CC3. The reason for this is that I wanted the rivers to look more natural. If you make the rivers in CC3 you get a curved line that has the same width all the way. I wanted the width to differ in size, that would make the rivers look more alive. Also I wanted the map to have a lot of details that you had to look for, details that together would want your imagination to start telling you a story. So it wouldn’t be just a map but something more. Did I succeed with that? Well that is for you to tell. One of the programs I use the most while mapping is CC3 from Profantasy. The good thing with CC3 is that due to the annuals they release every year, that gives you a new style every month, there is now a vast collection of styles that you can use. Most of the styles are quick to work with and you can produce a finished map that looks good in a rather short time. When we talk about short times and mapping, that still means quite many hours of work. But for me CC3 is usually the program I use in the beginning of my process of making a map, nearly all maps I start working on in CC3 will end up in Photoshop sooner or later. So why do I do that? Well mainly it is because whenever I use a style there are things I like to change or things I want to enhance. One of the drawbacks of CC3 is that when you work with a style you are limited to what’s in the style. You can of course use symbols from other styles in the particular style you’re using, but not many styles work well together. Sometimes you want more then what is offered and sometimes you just want to change the feeling of the map by adjusting the colours. Of course you can do a lot of those things in CC3 as well, but not all. And due to that my skills in CC3 are being quite limited it is much quicker for me to open up the map in Photoshop and do the changes I want there. As an example lets look at the latest style from the Annuals, the overland style made by JT Vendel. The style is absolutely gorgeous and the mountains in it are among the best ones released. But still there are things I want to do different. For a start I have some mixed feelings regarding the water texture, so I wanted to change the texture in the map and see how the result would be. When a friend of mine asked if I could make a map for his RPG campaign I thought it would be a perfect opportunity to test the style again, with my changes. To do this I picked a flat grey texture as the sea, in this way it would be very easy for me to select the grey water in Photoshop and replace it with something else, in this case a paper texture that I partially coloured blue and a pattern of waves that I made. However the sea felt a bit empty now so I added some sea monsters from the July issue of this years annual. Those monsters are only in black and white, so I had to colour them in Photoshop so that they would fit into the style. Another thing I like to do outside of CC3 are rivers. I like my rivers width to change while they flow downstream, it gives the rivers some more life. In CC3 the rivers will be a line with the same width all the way. Yes you can change the size of the line, but it will still just be a line. Also i feel like I have more control of how the river flows when I do them outside CC3, but that might just be me. I’m very pleased with the end result and the new sea texture and sea monsters gives the map a feeling of an old medieval map, in a fantasy sort of way. I think the feeling is different from when you use the original sea, which one that is better is hard to say. It is more about what version of the style that works best with the setting you are mapping for. This month saw the release of a new overland style in the monthly annual from Profantasy. 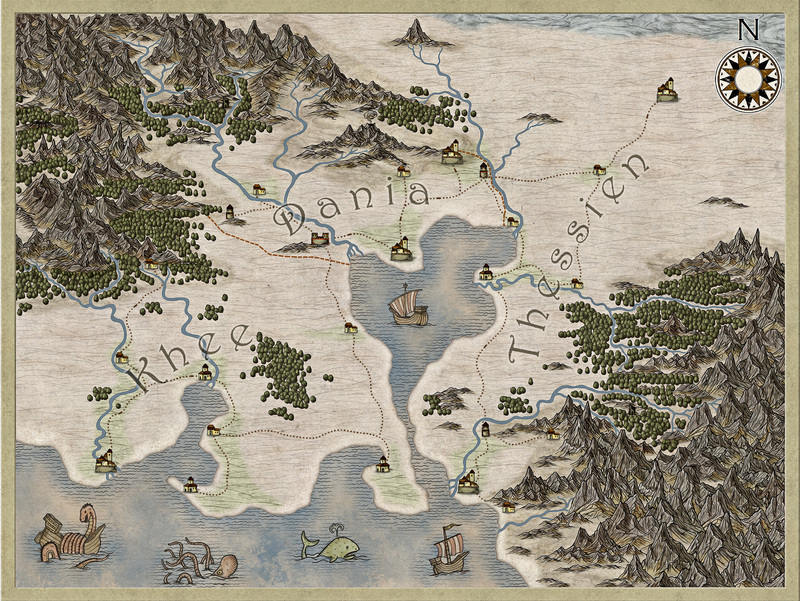 This style was made by TJ Vandel, or Schwarzkreus as he is known as over at the Cartographers guild. The style itself is lovely with a very handmade feel to it. It is quite sharp in its details and it feels like the symbols are made with a pen on paper. In the style you have an astonishing amount of mountains and hills to choose from. This is a style that crave a lot of mountains. They feel like the soul of the style. If you’re not going to use them you can as well just use another style. This style wont come to its full potential if you don’t use mountains in it. Apart from the mountains there are some nice textures of deserts, open plains, fields and more. You also get some really nice cities, castles and more to place in the map. The only thing I’m feeling very divided towards in the style is the sea texture. To be honest I can’t really decide if I like it or not. The sea texture is very colourful compared to the rest of the textures and this makes it take over the map a bit. At the same time it is the seas that makes the style unique compared to other styles. I guess I’ll use it in some maps in the future, but in some others I might try something else for the seas. The style was very easy to use and you can, thanks to the shear amount of symbols, very quickly make large mountain areas. So you can without a problem make a map in an evening if you need to, and the finished result is gorgeous. I’m definitely going to use it in more maps in the future. In the map I picked another font though then the recommended one. I didn’t like the included one in the style, but that might just be me. And one of the good things in CC3 is that If you don’t like the default font you can just pick another one. This month’s annual from Profantasy for Campaign Cartographer 3 (CC3) included a very nice looking overland style that has a comic book look and feel. I must admit that I really like it and it will definitely work perfect for maps I use when I play with my kids. So I decided to try it out. The style itself is as I said very charming and the symbol are well done. You have a good selection of things to put in your map, even though you always want more than what is delivered. But I know how hard it is to get everything in when you make a map style, I’ve actually added a symbol or two for the styles I’ve made for Profantasy when I started making maps with them. Doing that for this style could actually be a good challenge for my drawing skills. One thing I thought of after finishing my map in the style is that I made it a bit too wide, I thinks this style should be more dense looking to get it to look at its best. I’m still pleased with the result but my next map in it will probably be better, learning from the experience of the first one. The style is really fast and rewarding to work in and the time it takes to make a map in it compared to the time invested in the process of making it is very good. You can say you get a lot of good looks for very little time spent. Those with a sharp eye will also spot that I actually used another font than the included one for the map. There is actually no certain reason for it, I just wanted to test what the map would look like with another font. I will definitely come back to this style making a map or two and the only thing I miss now is a dungeon style with the same comic book feeling as this one. Lately I’ve been working hard on a new style for Profantasy. 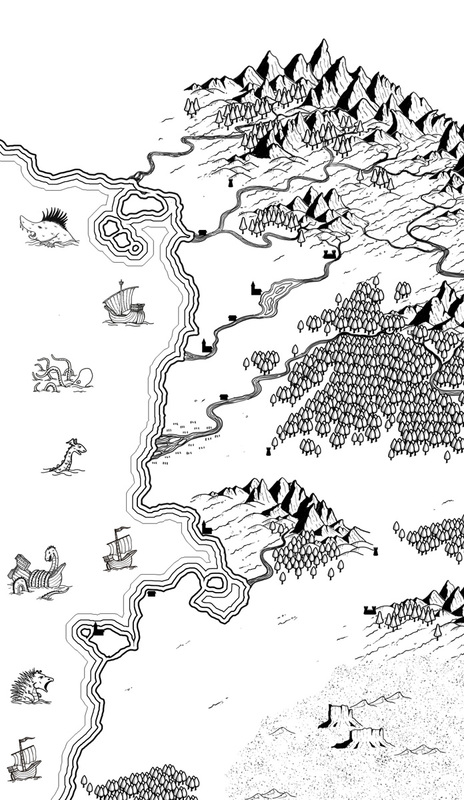 As you can see in the test map of the style it is a black and white style that hopefully will work very well in print. I have always been very fond of the old fantasy maps like the ones you found in the hobbit and the lord of the rings, black and white and very clean looking. Recently I’ve also made some old school dungeon maps so I thought that I’d like to have a black and white style that would work with these. First I only had some mountains, forest and rivers and simple icons for cities/towns but when I was asked by Profantasy if I could turn it into a style for them I decided I had to expand the number of symbols and textures that could be used. I’m still convinced that you should keep things as simple as possible with this kind of maps, this is really a style where less can be more. Let the negative space in the map do its job. But now this one won’t be just for me, and there might be a million reasons why someone wants to include some symbols that I wouldn’t. So I decided to work through the list of symbols that are the most common in the styles released by Profantasy. Then everyone can decide for them self what to include. The first map I made in the style had quite a lot of water in it, and while looking at the map I felt that the water area of the map was a bit empty compared to the land area with all its symbols of trees, mountains and hills. So I decided that I would add in some monsters like you have in old maps. 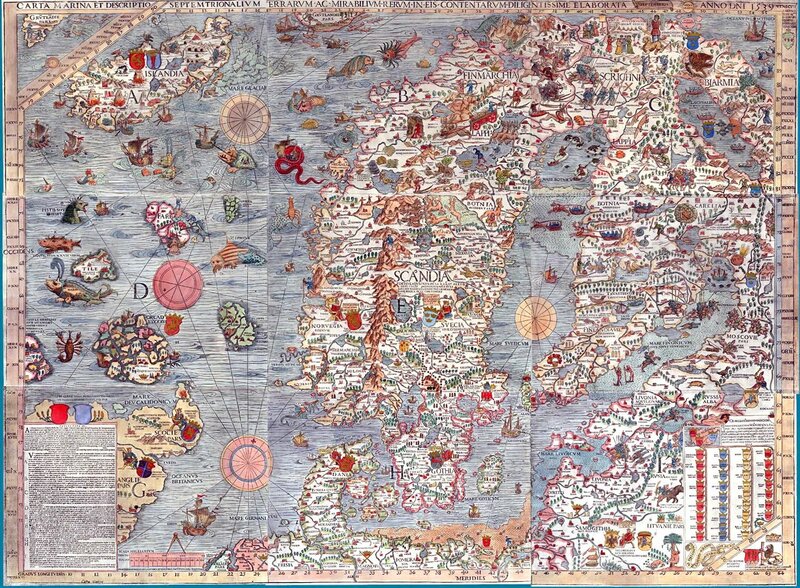 The inspiration to the included monsters is from an old Swedish map called the Carta Marina. In this map the sea is full of strange and scary monsters and snakes. Of course there had to be a ship or two as well that fearlessly sails through these dangerous waters. Making these monsters and ships has been a great challenge for me, I haven’t done anything like it before and I really had to push myself to the next step to make them. But it has been great fun and I must say that the monsters are probably the symbols I’ve enjoyed the most to make in this style. They’ve also inspired me to some more ideas for future maps, but more of that in a later blog post. The style is not completely done yet, I still have some small things to finish up and I need to make a compass and a scale bar. But you should all be able to see the finished result this summer, if you subscribe to the Annuals.